The Victorian Government is getting serious about drug and alcohol awareness among the youth. 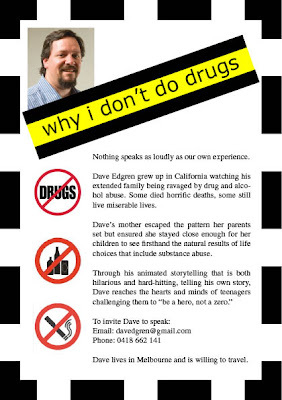 I've told my "why I dont do drugs" story at many schools in the past and thought it was time to get back into presenting it. The time seems to be right! Please click on the graphic and send the pic to anyone and everyone you know who may wish to book a performance!